Mansion in May Designer Show house and Gardens is a fundraising event held by the Women’s Association. Over the years this event has raised millions of dollars for the Morristown Medical Center. 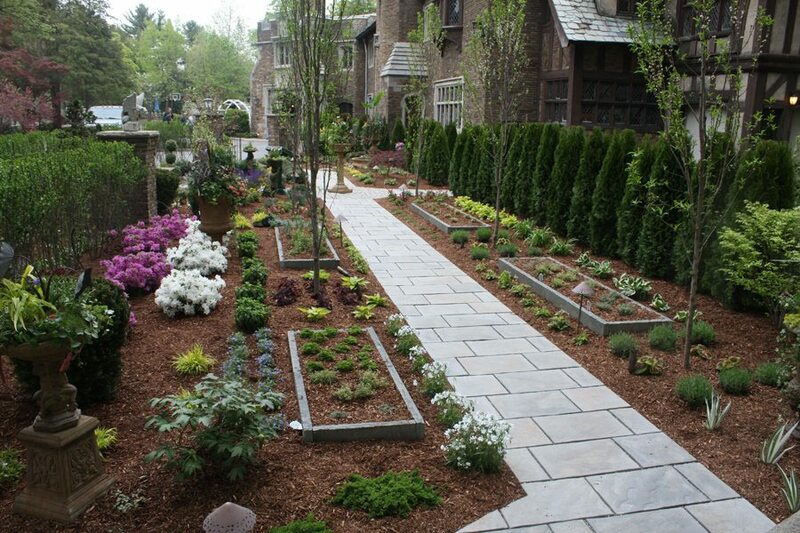 Lakeland Landscaping was given the opportunity to design and create a unique space on the mansion’s property. This space not only immensely enhances the mansion, but also helps raise funds for the hospital by attracting thousands of visitors during the month of May. A place to stop, rest, look and listen to nature, while you find yourself back in a time of simplicity, organization and old world craftsmanship and gardening. We have redesigned and renamed our space Compton Court Garden after the original owner of the home that the mansion was modeled from. 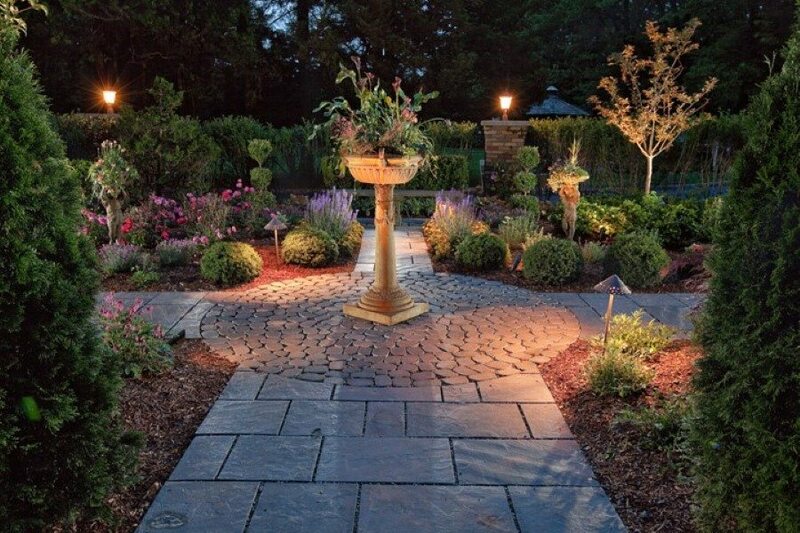 Formerly used as a shortcut to the side and back of the house, the space was transformed to a courtyard-like garden and pathway. The home was designed to emulate both the Medieval and English Tudor Style. As you drive up the stately tree- lined drive, you can’t help but notice the natural and rustic look of the newly installed stonework and plantings that anchor the corner of this castellated home. Custom designed pillars veneered with the matching time-worn brick of the home serve as a structural point between hedges of greenery creating a false wall. These pillars, tall and thin, replicate the architecture of the home’s 16 chimneys. Handmade and aged iron gates adorned with concrete angel statuaries that mimic the ones above the castles front door, welcome you into the sanctuary. Our pathways, laden with timeless natural bluestone, meander through our courtyard and take you to several focal points within the garden. We lead you to a nestled place under the Blue Atlas Cedar tree to stop and observe the grotto from above. As you pass through the flowering fruit trees, notice the raised, hand chiseled blue stone planter beds filled with various herbs, evident of a medieval type garden contrasted with formal green hedges that are in keeping with an English style garden. Several Gothic style statuaries, including gargoyles, urns, a bench, and a re-circulating stone fountain serve as focal points that emulate the style of statues found on and around the castle. We invite you to wander through Compton’s Court, stop, rest, look, and listen to nature while you find yourself back in a time of simplicity, organization and old world gardening.